Our bespoke Dog Grooming Spa is located within our converted stable block in the spacious grounds of Crossway Cottage, where I am able to offer a lovely, hygienic environment to pamper your dog. I have a simple ethos to treat your dog the same as my own (Jasper) in a caring environment where my priority is your dog’s comfort and well being. We offer bathing with hypoallergenic shampoos and conditioners, dry and brush/groom, de-matting (for those tough tangles) ear cleaning and nail trimming. Crossway Cottage also provides a local pick up service, where we pick your dog up and drop it off later that day within 2 miles of Crossway or for a small charge beyond. Booking implies that you have read and agree to our Terms & Conditions of service. 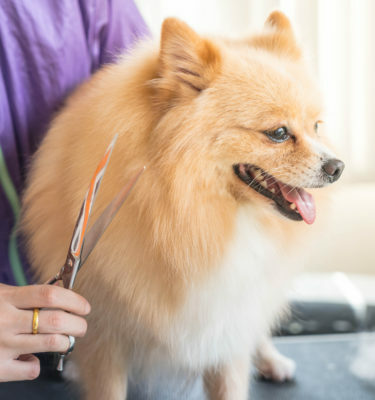 I have a simple ethos – that every pet I groom is treated the same as my own. Your dog is the client, their comfort and well-being is paramount.